The headlines today are full of stories about big brands losing out to smaller, fast growing ‘insurgent brands’, such as Halo Top ice cream, Skinny Pop popcorn and Dollar Shave Club. In particular, the dominant narrative is that millennials are deserting big brands in favour of smaller start-ups. Some articles go as far as predicting the demise of big brands altogether. So, are big brands doomed? We will explore this question in a series of posts, using findings from the research we recently carried out: a global quantitative survey of 100+ senior marketing professionals and research with 800 consumers in France, UK, India and the USA. 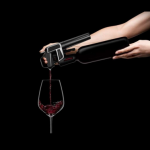 In this first post we look at the need to properly understand the insurgent threat for your brand. 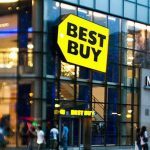 In follow-up posts we will look at the most important reasons for the growth of small brands and how big brands are fighting back. Smaller insurgents do pose a serious threat to big brands, according to 88% of marketing directors in our research. However, the hype and headlines have an overly narrow view that fails to tell the full story. Most analysis to date has been limited to consumer goods in North America and to a lesser extent the UK. The challenge for big brands (and for potential insurgents) is to better understand how the willingness of consumers to trust smaller brands varies by category and region. 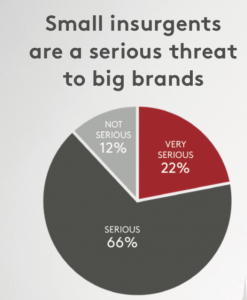 Our new research shows that the threat level from smaller insurgent brands varies by category (as measured by consumers’ willingness to trust smaller brands over big established ones). The highest threat level is indeed in fast moving consumer goods (FMCG), such as food & drink and household care, where purchases are relatively low price/low risk. However, even in consumer brands some big brands are winning: half the big brands in a 5 year US study by Ehrenberg-Bass grew sales, as we posted on here. And in this post we showed how 15 of the UK’s biggest 25 grocery brands grew in 2017, adding £250mill of sales. In contrast, the threat level is lower in more complex categories where trust is key, such as OTC medicine and financial services. This helps explain why 90% of UK consumers haven’t heard of a single new digital-only bank (e.g. Atom) and why 3 x more people believe big banks have a superior offer to non-bank ‘challenger brands’ (e.g. Tesco Bank) (1). Higher priced, higher status categories like sports gear and cosmetics fall in between. Insurgent threat also varies by region. 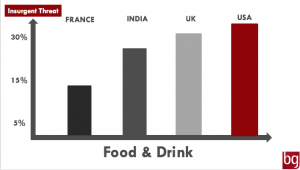 French consumers the least willing to try small insurgents in food, reflecting a more developed food culture. 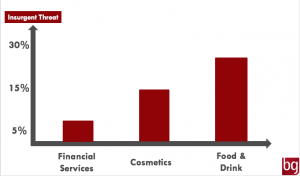 In cosmetics, UK consumers are more interested in small insurgent brands, with a high interest in brands backed by online influencers such as Kylie Jenner. In contrast, there is much lower trust for small brands in this category in India, reflecting concern around skin safety. In conclusion, ignore the blanket bad news coverage about the demise of big brands. Take a more objective view by properly assessing the insurgent threat (or opportunity) in the specific categories and countries where your operate.